Images in this blog post are licensed by Google Inc. under a Creative Commons Attribution 4.0 International License. However, images based on places by MIT Computer Science and AI Laboratory require additional permissions from MIT for use. Artificial Neural Networks have spurred remarkable recent progress in image classification and speech recognition. But even though these are very useful tools based on well-known mathematical methods, we actually understand surprisingly little of why certain models work and others don’t. So let’s take a look at some simple techniques for peeking inside these networks. We train an artificial neural network by showing it millions of training examples and gradually adjusting the network parameters until it gives the classifications we want. The network typically consists of 10-30 stacked layers of artificial neurons. Each image is fed into the input layer, which then talks to the next layer, until eventually the “output” layer is reached. The network’s “answer” comes from this final output layer. Why is this important? Well, we train networks by simply showing them many examples of what we want them to learn, hoping they extract the essence of the matter at hand (e.g., a fork needs a handle and 2-4 tines), and learn to ignore what doesn’t matter (a fork can be any shape, size, color or orientation). But how do you check that the network has correctly learned the right features? It can help to visualize the network’s representation of a fork. There are dumbbells in there alright, but it seems no picture of a dumbbell is complete without a muscular weightlifter there to lift them. In this case, the network failed to completely distill the essence of a dumbbell. Maybe it’s never been shown a dumbbell without an arm holding it. Visualization can help us correct these kinds of training mishaps. Instead of exactly prescribing which feature we want the network to amplify, we can also let the network make that decision. In this case we simply feed the network an arbitrary image or photo and let the network analyze the picture. We then pick a layer and ask the network to enhance whatever it detected. Each layer of the network deals with features at a different level of abstraction, so the complexity of features we generate depends on which layer we choose to enhance. For example, lower layers tend to produce strokes or simple ornament-like patterns, because those layers are sensitive to basic features such as edges and their orientations. If we choose higher-level layers, which identify more sophisticated features in images, complex features or even whole objects tend to emerge. Again, we just start with an existing image and give it to our neural net. We ask the network: “Whatever you see there, I want more of it!” This creates a feedback loop: if a cloud looks a little bit like a bird, the network will make it look more like a bird. This in turn will make the network recognize the bird even more strongly on the next pass and so forth, until a highly detailed bird appears, seemingly out of nowhere. 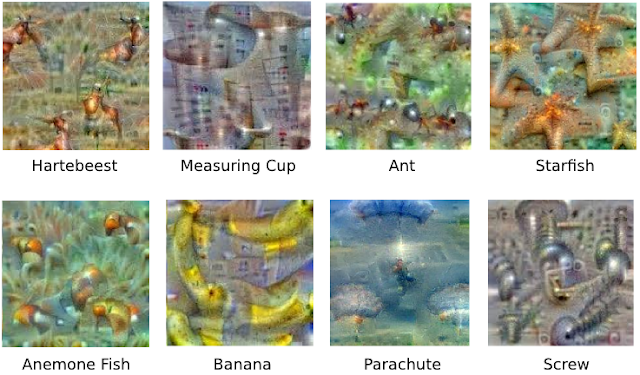 The results are intriguing—even a relatively simple neural network can be used to over-interpret an image, just like as children we enjoyed watching clouds and interpreting the random shapes. This network was trained mostly on images of animals, so naturally it tends to interpret shapes as animals. But because the data is stored at such a high abstraction, the results are an interesting remix of these learned features. Of course, we can do more than cloud watching with this technique. We can apply it to any kind of image. The results vary quite a bit with the kind of image, because the features that are entered bias the network towards certain interpretations. For example, horizon lines tend to get filled with towers and pagodas. Rocks and trees turn into buildings. Birds and insects appear in images of leaves. The original image influences what kind of objects form in the processed image. This technique gives us a qualitative sense of the level of abstraction that a particular layer has achieved in its understanding of images. We call this technique “Inceptionism” in reference to the neural net architecture used. See our Inceptionism gallery for more pairs of images and their processed results, plus some cool video animations. 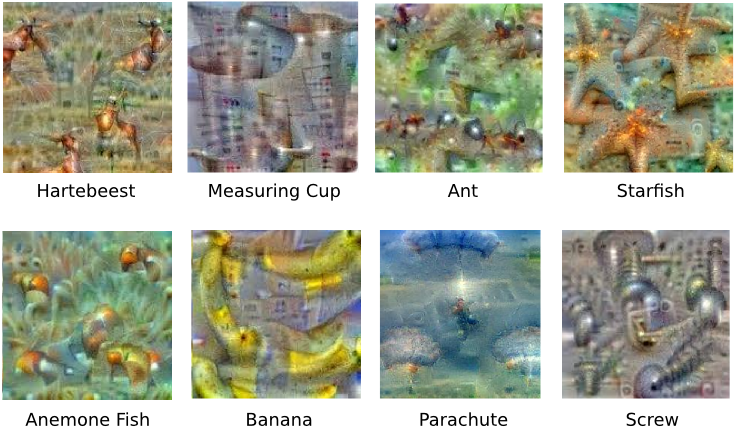 Neural net “dreams”— generated purely from random noise, using a network trained on places by MIT Computer Science and AI Laboratory. See our Inceptionism gallery for hi-res versions of the images above and more (Images marked “Places205-GoogLeNet” were made using this network). The techniques presented here help us understand and visualize how neural networks are able to carry out difficult classification tasks, improve network architecture, and check what the network has learned during training. 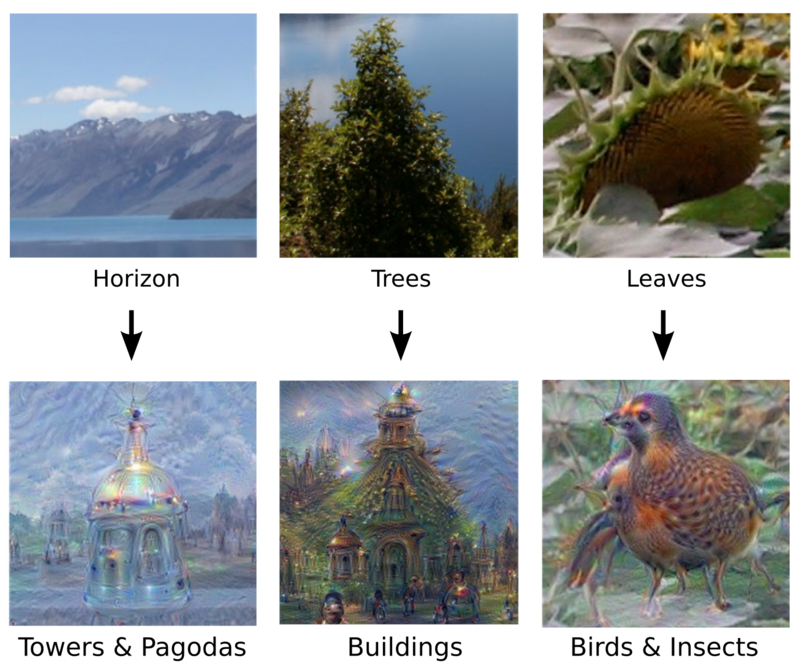 It also makes us wonder whether neural networks could become a tool for artists—a new way to remix visual concepts—or perhaps even shed a little light on the roots of the creative process in general.